The purpose of the media all the way back to the first handwritten and copied treatises has been to inform and to persuade. 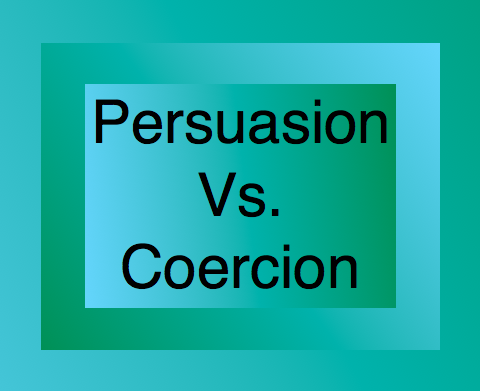 Coercion has been widely practiced by physical and economic force all through history. Today, we see the media deviating substantially from its intended purpose. It is now being used to coerce. When the FCC or other directed bodies find their original and true intended way once again, and separate the purpose of the media from its current use, we will be able to experience responsible journalism and advertising. I expect this to happen, because the current situation actually performs no service. A tool of coercion has no place in any society. Let America move forward to serve all of its people along its originally intended lines.